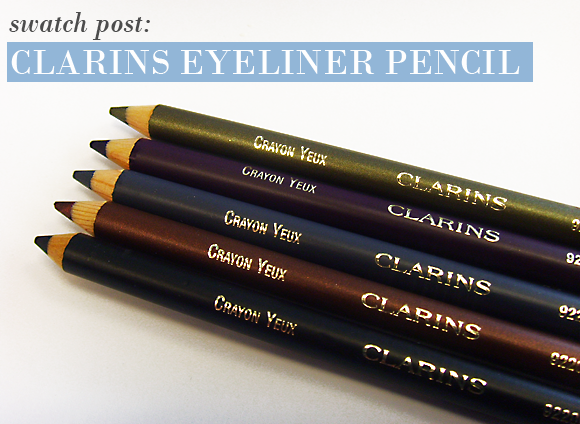 Softly define the eyes with the beautifully pigmented Clarins Eyeliner Pencil, available in 5 vibrant shades. The pliable formulation with achemillia means that the pencil can be used as an eye liner, an inner eye kohl, or even as an all over shadow. Just blend into the skin with the attached smudger sponge for an instant smokey eye. 1. 01 Black – This intense, matte black hue will be the most versatile product in your makeup bag. Perfect for lining all around the eye, creating retro 60s cat flicks, creating intense smokey eyes and lining the inner rim of the lids, it is ideal for all makeup users, no matter their level of skill. 2. 02 Brown – This multifaceted bronze-brown colour sets blue eyes off beautifully. With it’s golden undertone and subtle pink iridescence, it brightens your peepers effortlessly. A solid line of this hue along the lower lid is perfection. 3. 03 Grey – Blue-grey, ethereal and matte, this is the ideal colour for those who love smoky eyes but don’t want to commit to the intensity of black. It’s a flattering shade that looks great with all eye colours. 4. 04 Plum – Make brown eyes vivid with this intense plum hue. It has a matte finish and with a slight pink undertone, and is the perfect thing for adding a touch of glamour. 5. 05 Khaki – Pale eyes will adore this metallic green hue which is shot through with ultrafine, subtle golden shimmer. An instant eye opener that makes you look more awake and vital. 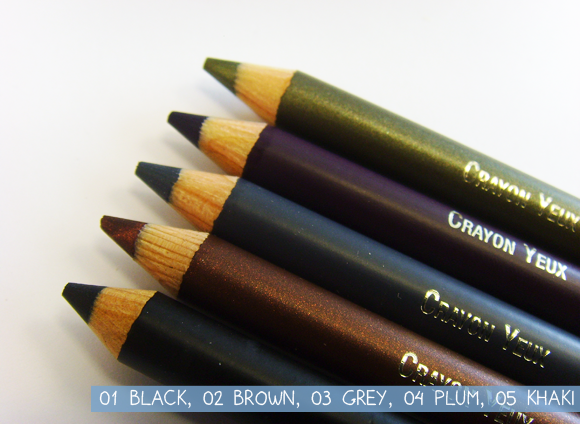 A lovely eye pencil, very smooth with no risk of damaging the delecate skin around the eye. A great bonus to have an in-built sharpener inside the lid, great idea!! 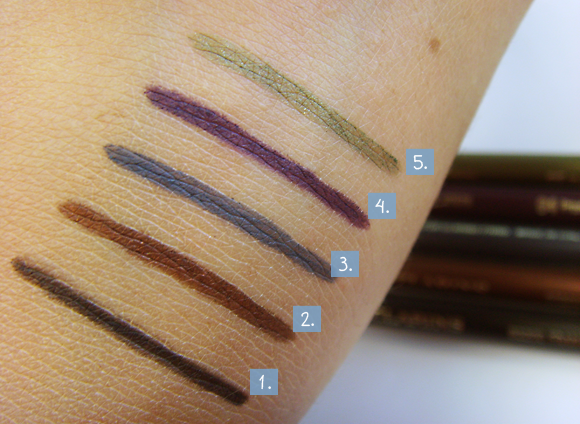 This entry was posted on Wednesday, May 30th, 2012 at 10:45 am and is filed under Make-up, Swatches, Tried & Tested. You can follow any responses to this entry through the RSS 2.0 feed. You can skip to the end and leave a response. Pinging is currently not allowed. Oh my gosh, I love all of them! !